A court-imposed deadline to reunite all migrant families separated at the border under the Trump Administration's "zero tolerance" prosecutions policy looms Thursday. 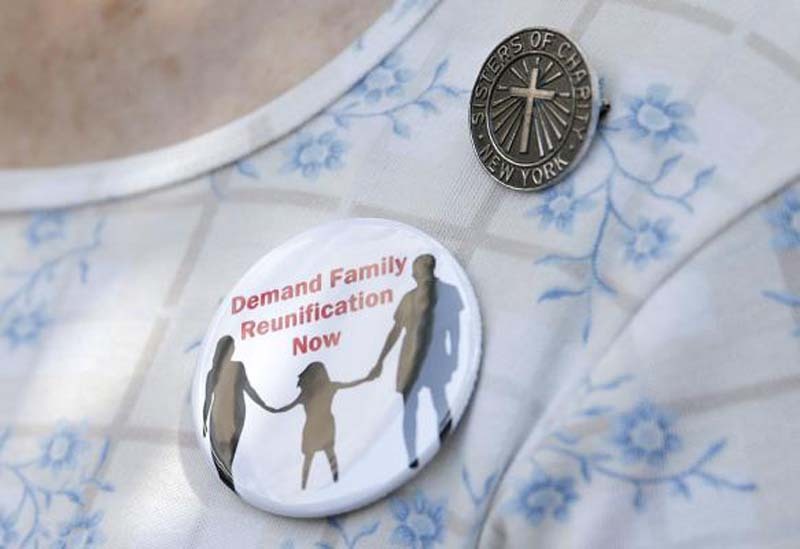 The federal judge who imposed the deadline held another status of parent-child reunifications conference call Tuesday. Since issuing a preliminary injunction halting family separations at the border on June 26, Southern California Federal Judge Dana Sabraw has required the government provide regular progress updates to the American Civil Liberties Union lawyers representing separated parents and children. [post_ads]Judge Sabraw heard 1,637 parents are eligible for reunification with their children. The court also heard the majority, or 1,112 parents, had already been reunified. When the Trump Administration ended family separations at the border to comply with President Trump's executive order on June 20, the Office of Refugee Resettlement announced about 2,500 children had been separated from parents at the border. Government lawyers now say the ORR's initial count was too high because many parents are not eligible for reunification. Sarah Fabian, Senior Litigation Counsel for the Department of Justice, told Sabraw's court there were no impediments to concluding the reunification process for the eligible parents, save for weather-related travel delays. Judge Sabraw commended the government for its "remarkable achievement." Sabraw said he expected the "reunification will be completed on time" of the remaining 525 parents. The government plans to complete most of the parent-child reunifications in the Karnes immigrant detention facility in South Texas. The court heard the Karnes facility is a "removal location" meaning that families would be reunified and then likely removed to their home countries. Questions remained, however, about a large group-914 parents-the government has declared ineligible for reunification. Of these parents 127 have waived reunification with their children, opting instead for removal or deportation without them. Still others parents have criminal histories, meaning the government cannot comply with its own guidelines concerning the child's best interests. The government will not release children to parents with criminal convictions. About another 260 children required further evaluation, government lawyer Sarah Fabian said, proposing some of "those were in fact unaccompanied alien children." But the government also stated to the court that more than half of these ineligible parents-more than 400-had already been returned to their home countries. Fabian specifically told the court 463 parents had already been deported or removed. She did not know if these parents were deported without their children but was trying to find out. The court heard 20 parents had indeed been reunited and removed from the United States. But under further questioning government lawyers could not confirm if these parents had been reunited with their children before being deported. "This is the deeply troubling reality of the case," Judge Sabraw said of the policy of separating families at the border. "Some of the information is unpleasant" and resulted from a policy of family separation with "no reunification or keeping track" of parents and their children. "Things really are a mess on the ground," said Lee Gelernt, the ACLU lawyer representing parents separated from their children. "We are not being told who's being reunified. Parents have no idea what's happening. I think the court is going to be shocked to hear how little people understood," the ACLU lawyer said. Gelernt said parents in immigration detention were informed in groups of fifty about their rights and asked within three minutes to sign papers about "giving away their child." Gelernt said he plans to file affidavits from parents about the reunification process. Gelernt's threatened affidavits from parents raised the ire of government lawyers. Department of Justice lawyer Scott Stewart told the court he was "disappointed to learn" about the ACLU's proposed filings. Stewart said the ACLU even initially characterized parents' complaints as "rumors." The government is "about to be blindsided by a raft of affidavits," Stewart said. He characterized the ACLU's affidavits as an attempt to "widen relief" beyond the specific parents eligible for reunification. Stewart said the government has "significant jurisdictional" issues about the court's involvement in immigration matters, outlining arguments in recent filings disputing the court's jurisdiction. Sabraw said he would address the government's concerns about jurisdictional issues in court on Friday. "We are proud of our efforts," Stewart said about the government's reunification plans. "We acted in good faith and we wanted to try to resolve this. We did what we could."